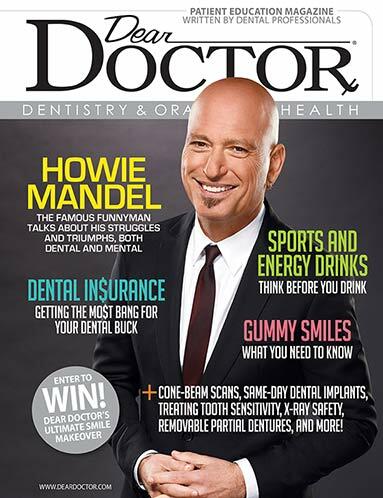 Each issue of Dear Doctor–Dentistry & Oral Health magazine is packed full of feature articles, state-of-the-art treatment options, and easy-to-understand solutions to real-world oral health challenges facing people just like you. We are committed to providing you with a high-quality dental magazine that has the perfect balance between entertainment, education, science, and beauty so that you can more readily understand and maintain optimal oral health. And by combining beautiful graphics and accurate illustrations with our simplified explanations for highly technical and complex treatments, you can easily grasp the subject matter. This unique approach best enables you to make confident, informed oral healthcare decisions for yourself and your family. American Academy of Cosmetic Dentistry (AACD). The AACD is dedicated to advancing excellence in the art and science of cosmetic dentistry and encouraging the highest standards of ethical conduct and responsible patient care while representing both the profession and the public. American Association of Endodontists (AAE). The AAE is dedicated to advancing the art and science of endodontics and to promoting the highest standards of patient care by serving as a global resource for knowledge, research and education for the profession, its members and the public. American Academy of Periodontology (AAP). The AAP exists to advance the periodontal and general health of the public and to promote excellence in the practice of periodontics. It supports evidence-based treatment and the unfettered dissemination of knowledge to improve public health and safety. International Congress of Oral Implantologists (ICOI). In addition to being the world's largest dental implant organization and provider of continuing dental implant education, the ICOI is devoted to providing implant education to the entire dental team to better serve patients. The TMJ Association (TMJA). The TMJA is a non-profit, patient advocacy organization whose mission is to improve the quality of healthcare and lives of everyone affected by Temporomandibular Disorders. For over 25 years, the TMJA has been sharing reliable information on TMJ Disorders. View past issues of Dear Doctor magazine.